The DAI-led Transition Initiatives for Stabilization (TIS) program in Somalia has put this theory into action. Funded by the U.S. Agency for International Development (USAID), the program aims to mitigate conflict, improve social cohesion, and create confidence in governance through service delivery. In the town of El Wak, which is geographically divided between Somalia and Kenya, the population is split between the Marehan and Garre clans in Somalia, and the Garre clan in Kenya. Conflict over limited resources often results in hostility between the two clans: “On the Kenyan side, they have a health center, with maternity care. I am from the Marehan clan and cannot access these facilities when we are fighting with the Garre. Not being able to access services only aggravates the conflict,” said one woman. To increase stability along the border, the TIS program first facilitated a planning session back in 2011, at the start of the program, bringing community and government officials together to choose activities to increase stability between the clans. The construction of a maternity ward and community hall was chosen as the best way to improve public services for all. Completed less than a year later, the maternity ward now offers a safe place for women to give birth, and the community hall provides a space for peace talks. 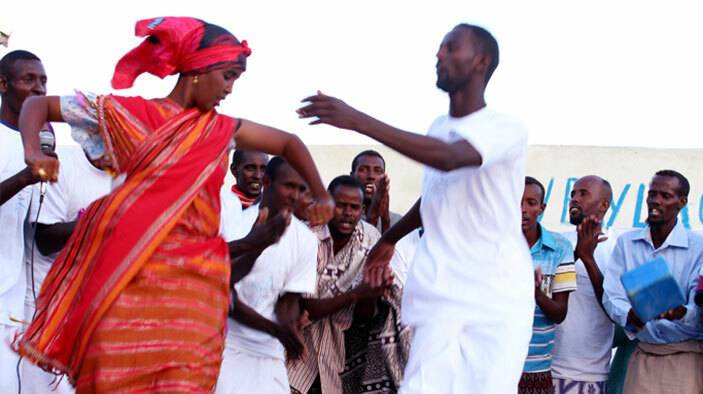 Northeast of El Wak in Puntland, similar celebrations were held in the coastal town of Bandar-Beyla. The TIS-facilitated initiative began during a planning session early in the life of the project and culminated in January 2013 when the Mayor of Bandar-Beyla officially handed over a new administration block, women’s center, school, clinic, cliff barriers and agricultural equipment to his community. The increase in services is already boosting trade in Bandar-Beyla and benefiting at least 800 residents. Since the school and health clinic were constructed, the population has increased and businesses have begun to thrive. Other organizations have begun to capitalize on the TIS program’s success. Save the Children is providing medical supplies, and two community health workers for the clinic, and UNICEF is giving blackboards and stationery to the school. This is the first phase of a wider USAID drive to support piracy-affected towns in Puntland. With funds being spent across Baargaal, Garacad, Eyl and Xaafuun, 41 new public services will be handed over the Puntland Government this year.